The Baylor Scott & White Health heart transplant program brings together the collective expertise of specialists with extensive experience in transplant surgery and medicine. Our multidisciplinary, integrated team approach to evaluation, diagnosis and treatment is ideally suited to the complex problems presented by heart transplant patients. In fact, we have treated some of the most complex heart transplant cases and have helped patients who have been turned away by other medical centers. In North Texas, the heart transplant program at Baylor University Medical Center, part of Baylor Scott & White Health, is one of the top-10 largest in the country – the first in Texas, by volume. It is one of only two centers in the U.S. that performs more than 60 heart transplants a year. We also offer advanced treatment options for patients who are not candidates for transplant or who are on a transplant waiting list long-term. In fact, the Ventricular Assist Device (VAD) Program for heart failure patients was the first in the country to receive the Gold Seal of Approval™ from The Joint Commission. Use our online tool to refer your patient to a heart transplant expert at Baylor Scott & White Health. 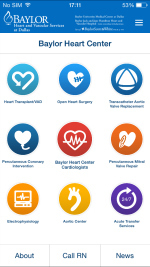 Download the free Baylor Heart Center app from the Apple App Store to your iPhone® or iPad® to access cardiovascular specialists on the medical staff of Baylor University Medical Center at Dallas and Baylor Heart and Vascular Hospital in North Texas. Just search for "Baylor Heart Center" in the App Store today.